One organic reusable Tea Bag. Made of GOTS-certified organic cotton. The string is long enough for using this bag with mugs or with a teapot. The string is natural unbleached cotton, with no dye, unlike the image. One Organic Reusable Tea Bag. Made with organic cotton (natural, unbleached), which is easier to rinse and wash. Replace commercial tea bags with reusables. 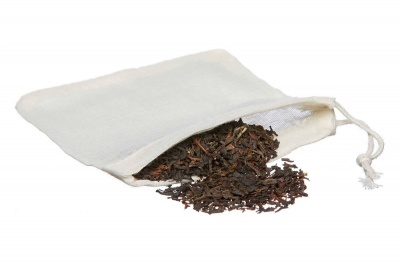 Reduces packaging waste and the energy and resources used to produce commercial tea bags. 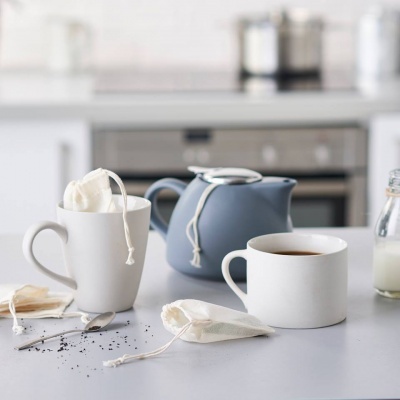 Most tea bags are not biodegradable and are actually made from plastic! This bag is made of GOTS-certified organic cotton. The string is long enough for using this bag with mugs or with a teapot. The string is natural unbleached cotton, with no dye, unlike the image. Long-lasting, washable and a reusable alternative to disposable filters and to metal-based ones. GOTS-certified, this ensures that the cotton has been organically grown and that fabrics have been treated in an eco-friendly way. Manufacturing in a small Indian factory. 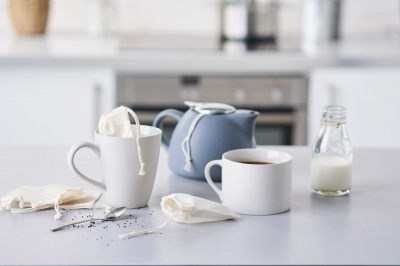 Simply add loose tea, enjoy a fresh cuppa, then rinse or wash and enjoy again and again. How to hand wash - turn them inside out and compost all the tea bits. Soak in cold water to help prevent stains. Hand wash in your sink with a little washing up liquid, then a quick rinse under the tap. Line dry. For a deeper clean, soak the tea bag for a few hours in vinegar and water(apple cider or white vinegar) 1 part vinegar to two parts water. If the tea bag was used for tea with milk - hand wash after each use. If no milk, rinse and reuse 1-2 times (same day) and then hand wash.